Thomas Williams was a lecturer in telegraphy at the School of Mines Ballarat for some years around 1909-1917. He was educated at St Paul's State School and Bain's High School attaining dux of that school and his matriculation in 1884. Williams entered the Victorian Railways as an apprentice telegraph clerk in 1884 and was one of the first telegraphers. He taught telegraphy at various stations before settling in Ballarat. From around 1888 he lived in Ballarat being the Officer in Charge from 1899. Williams excelled at lawn bowls being a member of Ballarat Bowling Club from 1891, honorary secretary 1893-95, and 1900-1902, vice-president 1906-1914, and president 1914-15 during the Club's jubilee year. Eight times club champion, he was Singles Champion at the Ballarat Club and Ballarat Bowling Association. In 1922 he toured the British Isles as skipper of the Australian team. He was a life governor of the Ballarat Orphanage and vice president of the Victorian Bands Association. The scientific instrument depicted to the right is an electromagnetic relay device, used in telegraphy and similar to the instruments used by Thomas Williams. The working parts are mounted on a brass plate, attached to a wooden base. It is equipped with four terminal posts and has an adjustable contactor mechanism. This instrument was probably acquired for use in telegraphy courses run at School of Mines Ballarat between 1874 and 1894. This biography compiled by Dorothy Wickham, December 2005, updated January 2007 with thanks to M. Hellard. 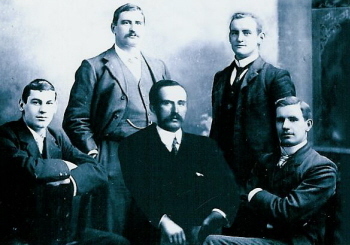 Image caption (RHS): The Williams brothers - Left to right: William Leslie, Thomas Arthur, John Ernest, Frederick Percy, and George Frederick the sons of John Williams who arrived in Australia in 1861. 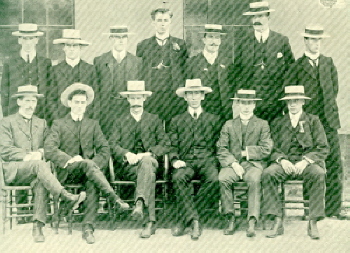 Image caption (LHS)- Left to right: P.A.Pratt, N.Buley, J.Sutherland, H.R.Murphy, J.Inglis, R.Nevett. Image caption (Lower RHS)- Electromagnetic relay device as used at SMB (Cat.No.4050).